Habitat: Deciduous forests, mixed deciduous and coniferous forests; forest edges; open country such as fields, pastures, swampy areas. Prefers woodlots adjacent to or surrounded by open areas. Diet: Small rodents such as voles, squirrels, mice, chipmunks; other small mammals, esp. cottontail rabbits, shrews, and moles; amphibians, reptiles; birds, esp. red-winged blackbirds; insects; carrion. 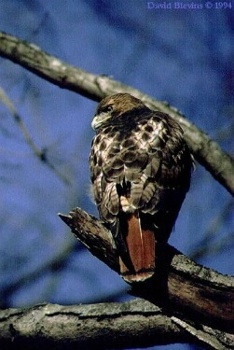 The Red-tailed Hawk's main hunting technique is to sit on a perch and scan the surrounding area for prey. It is also known to hunt by flying back and forth over an area at a height of about 200 feet or less. This buteo's keen eyesight allows it to spot its prey from a great distance. Unlike the Osprey, which will nest very close to human activity, the Red-tailed Hawk is sensitive to human presence. If disturbed, especially during the incubation period, it may abandon its nest. 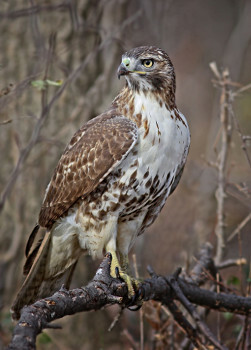 Only those Red-tailed Hawks in the northern part of their range are long-distance migrants. Those in the middle latitudes will withdraw slightly southward in the fall, migrating much shorter distances. Few Red-tailed Hawks are found in northern New England during the winter, but these birds are common in southern New England during this time. However, those particular hawks are most likely ones that have migrated from further north.